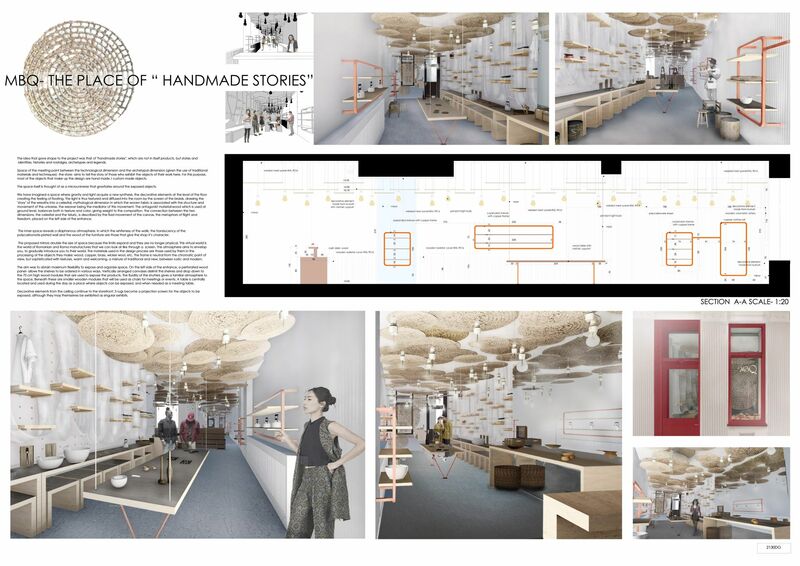 The idea that gave shape to the project was that of "handmade stories", which are not in itself products, but states and identities, histories and nostalgia, archetypes and legends. 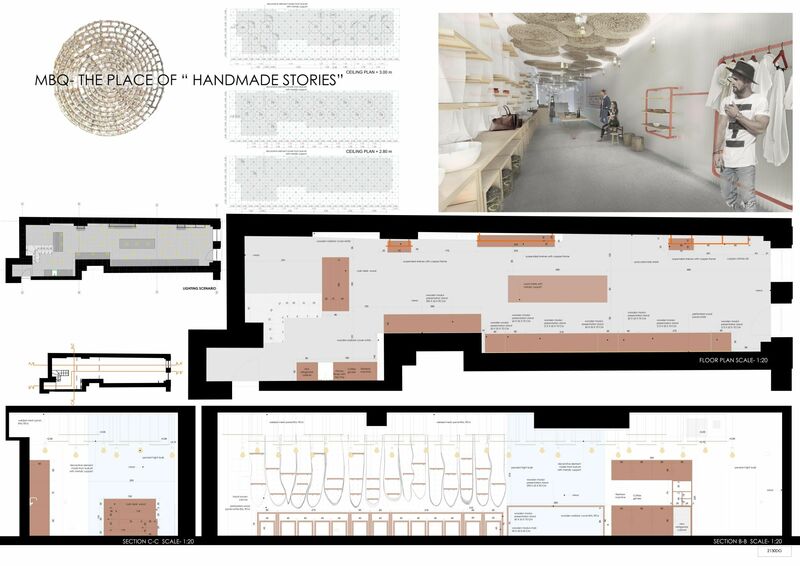 Space of the meeting point between the technological dimension and the archetypal dimension (given the use of traditional materials and techniques)- the store- aims to tell the story of those who exhibit the objects of their work here. For this purpose, most of the objects that make up the design are hand made / custom made objects. The space itself is thought of as a microuniverse that gravitates around the exposed objects. We have imagined a space where gravity and light acquire a new synthesis, the decorative elements at the level of the floor creating the feeling of floating. The light is thus textured and diffused into the room by the screen of the braids, drawing the "story" of the wreaths into a celestial, mythological dimension in which the woven fabric is associated with the structure and movement of the universe, the weaver being the mediator of this movement. The antagonist material:wood which is used at ground level, balances both in texture and color, giving weight to the composition. The connection between the two dimensions, the celestial and the teluric, is described by the fluid movement of the canvas, the metaphors of flight and freedom, placed on the left side of the entrance. The inner space reveals a diaphanous atmosphere, in which the whiteness of the walls, the translucency of the polycarbonate-plated wall and the wood of the furniture are those that give the shop it’s character. The proposed mirrors double the size of space because the limits expand and they are no longer physical. This virtual world is the world of Romanian and Roma manufactures that we can look at like through a screen. The atmosphere aims to envelop you, to gradually introduce you to their world. The materials used in the design process are those used by them in the processing of the objects they make: wood, copper, brass, wicker wool, etc. The frame is neutral from the chromatic point of view, but sophisticated with textures, warm and welcoming, a mixture of traditional and new, between rustic and modern. The aim was to obtain maximum flexibility to expose and organize space. On the left side of the entrance, a perforated wood panel- allows the shelves to be ordered in various ways. Vertically arranged canvases delimit the shelves and drop down to the 70 cm high wood modules that are used to expose the products. The fluidity of the shutters gives a familiar atmosphere to the space. Beneath these are smaller wooden modules that will be used as chairs for meetings or events. A table is centrally located and used during the day as a place where objects can be exposed, and when needed as a meeting table. Decorative elements from the ceiling continue to the storefront: 3 rugs become a projection screen for the objects to be exposed, although they may themselves be exhibited as singular exhibits.